The Winter War was a strange conflict. Taking place during the opening stages of the Second World War, it was largely isolated from this larger conflict, and would probably have gone down in the history books as yet another one of the minor campaigns of the war, comparable to the Yugoslavian campaign or the fighting in Iraq or Ethiopia, except for the fact that the Soviet Union did not achieve the goals it set out for. The war has been glorified, de-glorified and re-glorified more times than most, and there is a continuous stream of academic texts on virtually all aspects of it. Not claiming to be able to present the final narrative in any way, I believe there are a number of timeless lessons that easily can be deducted from the conflict. The Molotov-Ribbentrop pact came as a surprise to many, and was a very hard blow for a string of Central/Eastern European countries. The possibility of an alliance with Sweden was not there when Finland would have wanted it. The questioned deal for modern (and expensive) Blenheim-bombers for the air force was a great success, as these provided valuable service up until the end of the Continuation War. The two 3,900 t coastal defence ships of the Väinämöinen-class were heavily armed and armoured, sporting beautiful lines and wre up the pride of the small Finnish fleet. Aside from taking part in the AA-defence of Turku and bombarding the Soviet naval base in Hanko a few times, they spent most of their time unused. It is hard not to argue that the large sums invested in these couldn’t have been used better elsewhere. By the time the war broke out, it was very clear to both the political and military leadership that Finland needed, amongst other things, more anti-tank weapons, modern fighters, large quantities of artillery shells, and so forth. But with a global war brewing around the corner, there were extremely few places willing and able to supply these. Repeated countless of times, one of the main reasons why the Finnish forces managed to hold back the invaders for so long was the superior morale amongst the Finns. Asking soldiers to fight tanks by pushing logs between their road wheels can hardly be seen as anything more than a symptom of a lack of modern equipment, and will eventually make own losses unbearable (and will probably have a negative effect on the will to fight as well). The purges of what had been one of the most modern and innovative officer corps had far-reaching and well-known effects, and it is difficult to imagine that the Soviet losses would have been as great without Stalin’s purges of the inter-war years. At the end of the day, the qualitative edge of the individual soldier doesn’t alone determine the outcome of battles, numbers are needed too. …however, Finland was spared the fate of our southern neighbours. 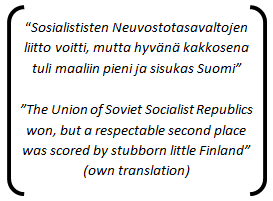 As stated in the beginning, Finland did not win the war, nor could we hope to win a similar conflict today. However, by making the price high enough, the Finnish defence forces were able to convince Stalin that occupying Finland wasn’t worth the hassle. Hopefully, today’s defence forces are able to maintain this deterrence. MTA 2020 – is it a (cheap) Corvette? Considering the cost/benefit ratio and role of Väinämöinen and Ilmarinen as part of the Finnish fleet during WWII nobody will argue, that the sum of money spent could have been better used especially during Winter War. But these ships had also mighty effect as possible deterrence to the enemy. Enemy had to consider ships firepower in various situations and campaigns. Although their use was extremely cautious and almost none extinct after Ilmarinen sunk. I agree, as I said, the point was that it is very difficult to know in advance which units and capabilities are useful and which aren’t. In hindsight, the whole Soviet Baltic was effectively taken out of the action by the German invasion of Estonia, but it is not difficult to imagine a scenario where this wasn’t the case. If then a flotilla of heavy ships based in Tallinn would have raided the Finnish coast and knocked out a few of Russarö’s heavy guns, a pair of floating 10” batteries might suddenly have become a good investment after all. Heavy gunships came obsolete later on, but I and V might have been more valuable with auxiliarry kind of ships (fast cotvette or frigate) forming small task units. Our gunboats Turunmaa etc. were too old constructs to be valuable as such. But then again, we were not building our navy or army as a stong assault force more like as defencing one. But the era before WWII was too short as nation to be able construct strong anything. In that sense in early 30’s build I & V were waste of sparse resurses.